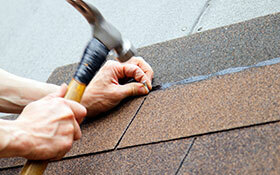 • Shingles are the most used material for residential roofing. They are made in a variety of looks, materials (composition, wood), and “lives” (20-, 30-, 40-, unlimited years). Composition (asphalt) shingles are usually less expensive than other roofing materials. They are durable, easy to repair, and ready available. The base of the shingle is between two layers of asphalt. Weather resistant mineral granules coat one side. The other side has a heat activated self-seal strip. Composition shingles commonly last 20 to 30 years. They are appropriate for most roof pitches and types. Wood shingles are more expensive than composition shingles. They provide good protection and energy benefits as well as a natural appearance. The shingles are sawn on both sides to provide a uniform look. When properly maintained, wood shingles can last 30 to 40 years. They are best used on steep pitched roofs that allow for water run-off. • Metal Roofing comes in two styles. Most standard homes employ screwdown with exposed fasteners. Standing seam, with concealed features, is usually considered an upgrade. • Concrete Roofing provides a “lifetime” roof. A building must be able to handle the high weight of the materials. Concrete roofing materials are not as expensive as clay tiles. However, they require the same expertise and level of work for installation. Concrete roofing tiles are made of sand, cement, and water; they come in standard or lighter weight. The tiles can be made to look like slate, clay, or wood shingles. The roofs usually have a top class fire rating and are rot and weather damage resistant. Concrete roofing is not recommended for a steep-pitched roof. • Clay Tile Roofing requires special underlayment. It comes in one-piece and two-piece styles. It is an upgrade above concrete. Clay tile roofing is an expensive roofing option due not only to the cost of materials but also to the cost of labor intensive installation. The tiles come in a variety of shapes and colors. Clay tiles provide outstanding protection from fire, rot, insects, and the toughest weather elements. They are also very fragile and must be handled as such during maintenance and when repairs or replacements occur. Clay tile roofing lasts at least 40 years. It would not be impossible for it to last 100 years! • Flat Roofing is a relatively low-cost roofing option used for most commercial applications and for some residential patio roofs and decks. It can be torch-applied or hot mopped. Built-up, tar and gravel roofs involve layers of heavy roofing felt and hot tar or asphalt. Modified bitumen roofing adds a layer of fiberglass or polyester with bitumen for added durability. The top layer gets a coating of gravel. Hop mopped asphalt may be restricted in some areas due to the high levels of air pollutants. Roll roofing materials are similar to asphalt shingles. The torch-applied single-ply roof usually lasts less than ten years. Therefore, it is often seen as only a temporary fix for a flat roof issue.